Arthur 'Bugs' Baer once said, “A newspaper is a circulating library with high blood pressure.” So why start your Monday overloading the brain with negative news. Jump-start the engine and schedule some garden reading. If you are looking for a coffee table addition for your upcoming winter perusal, ‘Bloom's Best Perennials and Grasses: Expert Plant Choices and Dramatic Combinations for Year-Round Gardens’ is a perfect choice. Another Timber Press hardcover, you shan’t be disappointed by this book’s lovely photographs and philosophy. The Bloom family, the Blooms of Bressingham, has been gracing us for decades with their perennial introductions and developments. My favorite Bressingham is Crocosmia ‘Lucifer’ and of course, there is Geranium ‘Rozanne’, the workhorse for many perennial gardens and a 2008 PPA Perennial Plant of the Year. 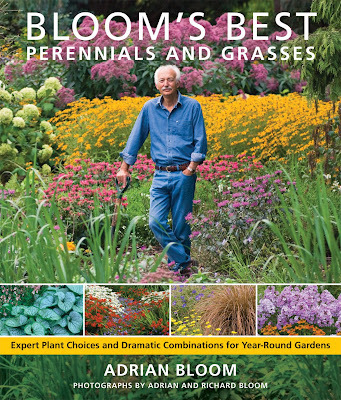 If you are looking for one worthy gardening book for your holiday list, this is a well-rounded choice. Six chapters lay the garden process out neatly for even the novice but trust me. Your die-hard plant geek will love this one for the shelves. The spectacular imagery along with the insightful text is timeless; key factors when collecting for your garden library. If you didn’t get out and enjoy the brilliant New England weather this weekend in the gardens, you best have a darn good excuse. There is going to be plenty of time for cozying up with a book. But when you do curl up by the fire, sneak a peek at Bloom’s latest and tell me if you agree.